Alcorn State University (Alcorn) is a historically black comprehensive land-grant institution in Lorman, Mississippi. It was founded in 1871 by the Reconstruction-era legislature to provide higher education for freedmen. 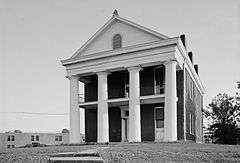 It is the first black land grant college established in the United States. The university is counted as a census-designated place and had a resident population of 1,017 at the 2010 census. The university's most famous alumnus, Medgar Evers, a civil rights activist, graduated in 1948. Students at the college were part of the mid-twentieth century civil rights struggle, working to register residents for voting and struggling to end segregation. Other alumni have been activists, politicians and professionals in Mississippi and other states. The university is a member-school of the Thurgood Marshall College Fund. This was the first black land grant college in the country. Congress required that states with segregated educational institutions (as was maintained in all the former Confederacy) designate black land grant colleges in order to receive land grants monies for white colleges, as Congress had authorized the program to benefit students of all races. 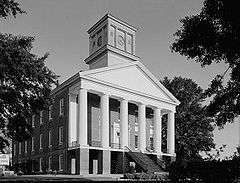 Alcorn University started with what are recognized as three historic buildings. United States Senator Hiram R. Revels resigned his seat when offered the position as Alcorn's first president. The state legislature provided $50,000 in cash for ten successive years for the establishment and overall operations of the college. The state also granted Alcorn three-fifths of the proceeds earned from the sale of 30,000 acres (12,000 ha) of land scrip for agricultural or land grant colleges under federal legislation. The land was sold for $188,928 with Alcorn receiving a share of $113,400. This money was to be used solely to support the agricultural and mechanical components of the college, which Congress wanted to develop nationally. From its beginning, Alcorn State University was a land-grant college. In 1878, the name Alcorn University was changed to Alcorn Agricultural and Mechanical College. The university's original 225 acres (0.91 km2) of land have been expanded to develop a 1,700 acres (6.9 km2) campus. The goals for the college set by the Mississippi legislature following the Reconstruction era emphasized training for blacks rather than academic education. The school, like other black schools during these years, was less a college than a vocational school intended to prepare students for the agricultural economy of the state andof most of their hometowns. In 1974 Alcorn Agricultural and Mechanical College was renamed Alcorn State University, representing the development of its programs. Governor William L. Waller signed House Bill 298 granting university status to Alcorn and the other state-supported colleges. Alcorn had already become a more diversified university, with graduate programs. It provides an undergraduate education that enables students to continue their work in graduate and professional schools, engage in teaching, and enter other professions. It also provides graduate education to equip students for further training in specialized fields. While early graduates of Alcorn had limited horizons, more recent alumni are successful physicians, lawyers, pharmacists, dentists, educators, administrators, managers, and entrepreneurs. Jay Searcy of the Philadelphia Inquirer said in 1994 that except for its football team, Evers, and "an occasional Olympic athlete," "Alcorn rarely gets mentioned outside the state of Mississippi." Alcorn State is accredited, with seven schools and degree programs in more than fifty areas, including a nursing program. The facilities number approximately 80 modern structures with an approximate value of $71 million. In late 2013, the state began investigating the university's purchasing policies. Three administrators, including the president and the chief financial officer, have resigned while these investigations have been conducted. The university enrolls over 3,000 full-time and 300 part-time undergraduate students and 600 graduate students. The university has seven schools, offering more than 50 different fields of study. Alcorn's honors program is an option for highly qualified undergraduate students who wish to enhance their academic experience and leadership skills. Alcorn State University offers a general Master of Business Administration (MBA) program through its Natchez campus. Classes are conducted in evening to accommodate its working executive students. Additionally, students off-site may join the live lecture classes via live video feed through the internet. The MBA program offered by Alcorn School of Business is accredited by the Accreditation Council for Business Schools and Programs (ACBSP), global accrediting body for quality business degree programs. Ever since its inception, the Alcorn State's MBA program has been very popular with international students. Alcorn offers pre-professional programs to prepare students for a transition to specialized studies in the fields of law, engineering, nursing, physical therapy, pharmacy and dentistry. Alcorn State University is accredited by the Commission on Colleges of the Southern Association of Colleges and Schools to award the Associate, Bachelor's, Master's, and Specialist in Education degrees. Alcorn's teacher education program is accredited by the National Council for the Accreditation of Teacher Education. The Bachelor of Science in Nutrition and Dietetics is accredited by the American Dietetics Association. The Associate of Science in Nursing degree, the Bachelor of Science in Nursing degree, and the Master of Science in Nursing degree programs are accredited by the National League for Nursing Accrediting Commission. Alcorn State University is an accredited institutional member of the National Association of Schools of Music, the National Association of Industrial Technology, and the American Association of Family and Consumer Sciences. The main campus is located near Lorman, Mississippi. The Nursing School and the Business School's Master of Business Administration (MBA) program are located in Natchez, Mississippi. The university also has a class center in Vicksburg. 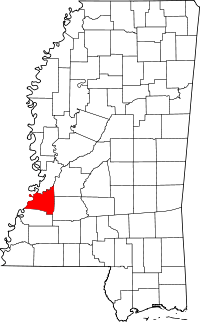 The main campus is located in rural southwestern Mississippi, 45 miles (72 km) south of Vicksburg, 40 miles (64 km) north of Natchez, and 80 miles (130 km) southwest of Jackson. As of 1994 the closest hotels and/or restaurants to the Alcorn campus are 15 miles (24 km) away along U.S. Highway 61. Jay Searcy of the Philadelphia Inquirer wrote in 1994 that Alcorn had "a gritty football team that has sent 68 players to the National Football League". His article was chiefly about Steve McNair, who is among those numerous players to have gone on to professional football careers. In 1994 the school had no field house, and the budget of the university's athletic department was smaller than that of several high schools. At the time the department occupied cubicles in the school's physical education and health building. Alcorn State University's marching band is known as the "Sounds of Dyn-O-mite" (SOD). The band has more than 200 members and was founded in the 1960s. The "Golden Girls" (GGs) is an established dance squad that has been featured with the marching band since its inception. The marching band is led by four drum majors. ↑ "Alcorn State University: Alcorn's preliminary fall 2016 enrollment". Alcorn.edu. Retrieved 2016-09-24. ↑ "Alcorn - Graphics Standards Manual". Redstardigital.net. Retrieved 2016-04-09. ↑ "Profile of General Population and Housing Characteristics: 2010 Demographic Profile Data (DP-1): Alcorn State University CDP, Mississippi". U.S. Census Bureau, American Factfinder. Archived from the original on September 11, 2013. Retrieved March 28, 2012. ↑ Brown, Ray C. (December 2, 2014). "Mississippi Colleges that have Closed, Merged, Changed Names". Ray C. Brown. Retrieved 2015-02-07. 1 2 3 4 5 Searcy, Jay. "A Phenom Puts The Middle Of Nowhere On The Map Alcorn State's Steve Mcnair Is An Out-of-this-world Qb In An Out-of-the-way Place. He's Getting It A Lot Of Attention." Philadelphia Inquirer. November 1, 1994. Retrieved on May 3, 2012. ↑ "Alcorn State President Christopher Brown resigns amid investigation". gulflive.com. Associated Press. December 19, 2013. Retrieved December 20, 2013. ↑ "Alcorn State University: Past Presidents". Alcorn State University. Retrieved September 20, 2012. ↑ "Archived copy". Archived from the original on March 22, 2013. Retrieved September 20, 2012. ↑ "Archived copy". Archived from the original on March 19, 2011. Retrieved February 14, 2011. ↑ "Archived copy". Archived from the original on February 14, 2011. Retrieved February 14, 2011. ↑ "Archived copy". Archived from the original on December 30, 2010. Retrieved February 14, 2011. ↑ "Driving Directions." Alcorn State University. Retrieved on April 25, 2012. ↑ "Male residence halls." Alcorn State University. Retrieved on May 3, 2012. ↑ "Female Residence Halls", Alcorn State University. Retrieved on April 25, 2012. ↑ "Online History – Washington State". state.ak.us. Retrieved 2011-01-29.